Rocket Mortgage is an online lender with a user experience designed to save time and make mortgages easy, with many options. Rocket Mortgage is fully designed for digital natives with an advanced and smooth loan platform that keeps the entire process online and on smartphones. There are plenty of mortgage options and rates are constantly updated to keep borrowers on top of the details. The site design and apps are sleek and easy to use with excellent customer service and automation to speed up the loan process. Rocket Mortgage is run entirely online with all of the information provided on the website or mobile apps, making it best suited to digital natives who are used to running all aspects of their lives from their mobile phones. The many mortgage options make it suitable for borrowers with small down payments and lower credit scores. Users who prefer flexibility will prefer the variable ARM mortgage while the traditional fixed-rate mortgages provide reliability and certainty for anyone who likes to plan their budget in advance. Rocket Mortgage has a variety of loan features. Create an account which takes about 5 seconds. Get your quotes. You can customize them by adjusting your down payment, monthly payments, or loan term until you’re happy with the funding option before you. Click the button to request approval online. Come back and log in again the next day or every day for as long as you’d like to check on the changing rates, then only click the button to lock in rates once you’re happy. E-sign all of the relevant paperwork online and closing can happen where and when you want it. The platform for Rocket Mortgage is advanced. Both the apps and the website are easy to use and smooth to navigate from every device, making it a dream for Millennials. It’s possible though that anyone who isn’t fully comfortable making major financial decisions online will feel nervous about this entirely digital platform. Rocket Mortgage offers a full range of mortgage, refinancing, and home equity loan options that include government-backed loans, rivaling that of a traditional bank. Thanks to real-time rate updates, new borrowers can stay in control of their financing options by logging on as often as they want to check for the newest rates before locking in the best deal. That said, the sheer number of loan options can be overwhelming. It’s not really possible to browse loan terms and rates without creating an account and inputting your full financial information, making it difficult for the casual browser to compare loan options. If you’re serious about taking out a mortgage, it’s worth it to go to this trouble. However, anyone who just wants more information about their options is likely to shrink away from having to share so many details just to get better loan rate information. It’s difficult to share exact terms of Rocket Mortgage loans and mortgages because APR rate information can only be accessed by sharing all of your financial details and getting a personalized quote. You also can’t find out how much of a down payment you need to make without going through the entire application process, although Rocket Mortgage does offer FHA loans which require a down payment of as low as 3%. Rocket Mortgage does reveal that terms range from 8 to 30 with the YOURgage loan and that variable rate mortgages have terms of 5 or 7 years. Rocket Mortgage only gives loans for owner-occupied homes, not for investment properties. Fortunately, Rocket Mortgage uses advanced automated tools to make it faster and easier to import your full financial information. Rocket Mortgage offers traditional fixed-rate mortgages of 15- or 30- year terms. The variable ARM loans have terms of either 5 or 7 years. Somewhere in between, in terms of both repayment period and the level of flexibility, are the unique YOURgage mortgage loans, which allow the borrower to choose any term between 8 and 30 years and lock in to a fixed-rate mortgage. APR rates aren’t available until you complete a full application. 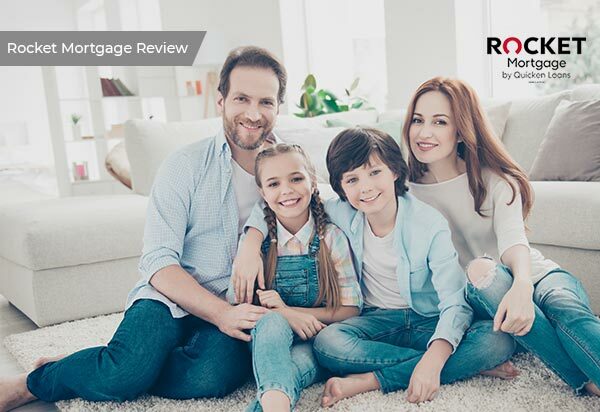 Rocket Mortgage gives an impressive level of support, particularly through the live chat, which is accessible at the touch of a button from the mobile apps and the website. Live chat isn’t quite round-the-clock but it is open from 7am to midnight ET on weekdays and 9am to midnight on weekends. There’s also telephone support for more traditional borrowers from 9am to midnight on weekdays, 9am to 8pm on Saturdays, and 9am to 7pm on Sundays. Rocket Mortgage is a very fast and digitally advanced mortgage loan provider that offers an impressive range of refinancing and mortgage options including VA and FHA loans which can be hard to find online. The application process is entirely online and speeded up thanks to advanced automated tools. Between a highly functional website and effective mobile apps, Rocket Mortgage makes it easy to keep coming back and checking up on real time APR rates until you find the exact deal you want. Fast application times and excellent and responsive customer service add to the attraction of this loan provider.